Scuba diving in Maldives is one of the truly unforgettable impressions that you can enjoy on these Paradise Islands. Maldives is a unique place where everyone can find the best conditions of diving according to his abilities. The beginners may try to dive in special sites with gently sloping hills inhabited by colorful corals, tropical fish, manta rays, sea turtles, and sharks. Dive from a liveaboard, resort or local island? The Republic of Maldives is a coral archipelago located in the hub of the Indian Ocean to the South-West of India and Sri Lanka. It consists of 26 individual atolls and stretches for about 900 kilometers from north to south. The equator divides Maldives near the Addu Atoll. Maldives is a chain of almost 1200 islands most of which are uninhabited. Approximately 200 islands are inhabited by the local people and another 150 islands are fashionable resorts. The Maldives capital Malé stretches 2 km in length and is 1,2 km in width. It is one of the most densely populated cities in the world. Visibility varies from 15 to 50+ meters. The turbid waters attract manta rays, big shoals of fish and in some cases whale sharks. The water temperature is 26-30°C all year round. The climate is tropical and hot with plenty of sunny days with an average temperature of 25-33 around the year. You can dive at any season of the year but from April to October the monsoon brings a large amount of precipitation. (from April till June it rains the most) However heavy storms are unusual here. The marine life. Maldives house about 1100 fish species, 400 muscles and 83 varieties of echinoderms including manta rays, grey reef sharks, snipers, parrot fish and etc. The average diving depth is 15-30 m.
The required level of certification is Advanced Open Water. The underwater relief of Maldives varied. It offers many types of diving and different regions of the archipelago offer different experiences. So let’s see the relief in detail. The famous Maldivian channels are effectively natural canals connecting the ocean and the interior waterways of the atolls. The width of such channels usually varies from 100 to 400 meters and they’re 30-40 meters in depth. The currents generated by the water entering and exiting the atolls are known to be very strong and to attract sharks and eagle rays. It should be better to hang with a diving hook on the bottom of Kandu. It happens that a very strong current can even pull out the regulator from your mouth. One of the best channels are Fotteo and Golden Wall, Vaavu Atoll. You can read more here – Azalea Cruise diving trip. Faru is a reef that surrounds the atolls. It is often just below the surface or can reach a few meters deep. It often sticks out during the low tide. Faru diving is often a drift-dive. One of the most interesting site is Madivaru Corner, near local island Rasdhoo. Giri is separate from the island reef the top of which can be seen from the surface. Thila generally has a submerged top between 15 and 30 m. Giri pinnacles are accessible to all divers whereas thilas are often more suitable for experienced divers. 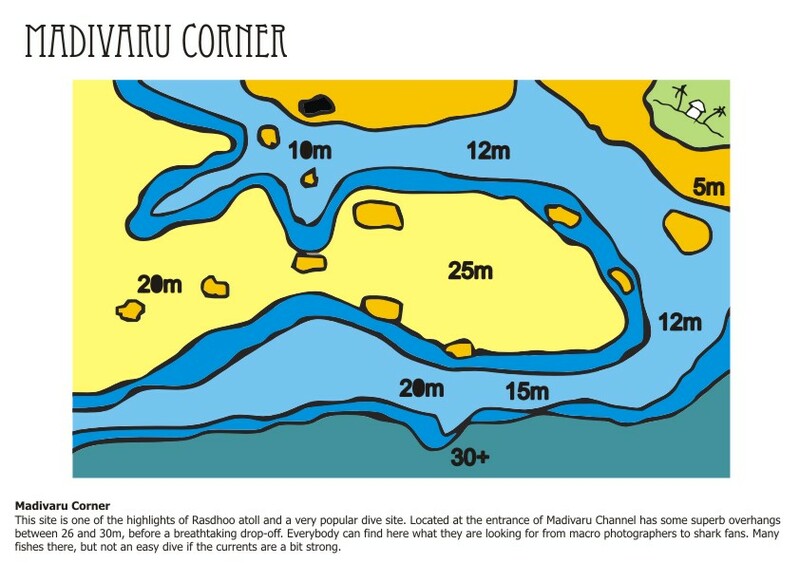 The best example of giri is Kuda Giri Wreck, Maafushi (as you can see on the map above). Many divers ask “What is the best diving season in the Maldives?” First of all you must understand that Maldives has only two seasons: the north-east monsoon and the south-west monsoon. The word monsoon in this context does not mean everyday rain, quite the opposite in fact! During the north-east monsoon (known as the dry season which occurs between the end of December till the end of April) trade winds originating in the Indian subcontinent carry rich ocean waters towards the archipelago’s coast. It’s mostly sunny during these days. The ocean is calm and there’s no wind almost. The visibility is 50+ meters in the eastern part and 25m in the western. The water is very clear to the east and a phenomenon called the ‘upwelling’ carries with it a significant quantity of plankton. This plankton is the foundation of the food chain that in-turn feeds all manner of marine life from the smallest of creatures to the most majestic of manta rays. That’s why you may find plenty of different marine creatures in the eastern part especially at the entry of kandu channels: gray sharks, whitetip sharks, eagle rays, napoleon fish, etc. During this time manta rays return from the west to the so-called clearing stations. It’s a unique opportunity to see the underwater dances of these sea giants. The south-west monsoon starts at the end of May and ends at the beginning of November. As you may already have guessed it brings lots of rains. During this time the marine life is more active in the west part of Maldives. The visibility is great during May-July and later the water starts to get turbid due to the plankton brought by the current. So from August to November is the best time to see manta rays. The most impressive is Hanifaru Bay marine reserve during this time, you can see up to 200 manta rays! It should be mentioned that it’s allowed only to snorkel there because the diving is prohibited since 2012. Raining season is the best time to go to the south and deep south by liveaboard as it’s a shark season. The north-east monsoon from December to April is for many reasons the best time for diving in the Maldives. Certainly, the risks of a quick downpour are less but still. The prices at this time of the year are significantly higher. However you should expect a greater rainfall during the rainy season but despite this, the diving experience is not at all compromised, far from it. During the past years, a seasonal climate shift is observed not only on Maldives but all around the world. That’s why you cannot state that January will not have rains at all. As well as you may not be sure about a number of sunny days in June. The sea temperature varies little from season to season and is usually between 26°C and 30°C. (except the deep south where the temperature can go down to 24°C during the north-west monsoon). It is impossible to start this section in any other way than to dive straight into what every visitor to Maldives wants to see: manta rays and whale sharks. Maldives is a home to the largest population of manta rays (Manta alfredi) in the world with an estimated 5000 to 7000 species! It is equally possible to come across manta alfredi and manta birostris in exactly the same place. Anyway, they are slightly different. You may see manta rays almost everywhere in any atoll. They even come almost every day (especially during the monsoon) to the clearing station which is just next to the capital Malé, near Paradise Island Resort. Besides manta rays, it is possible to see the biggest fish in the world – whale shark (Rhincodon typus). In Maldives the average size is 6-8 m. So far more than 200 whale sharks have been identified and are regularly seen according to the data by provided by Maldives Whale Shark Research Programme. They will generally be observed to the south of the Ari Atoll ( the islands of Sun Island Resort and Spa, Holiday Island resort and Spa) and Addu City Atoll. Till 2013 it was possible to see these sharks in Hanifaru Bay but since then it’s quite a rare thing (1-2 times a season). But for sure you’ll witness these sharks only in South Ari Atoll. And it is possible to go snorkeling and diving there. Apart from seeing whale sharks and manta rays diving on Maldives is a veritable feast of many different species such as gray reef, whitetip, nurse, thresher, hammerhead and even tiger sharks. Though the former is the second largest predators after the white sharks, nobody is reported to be hurt on Maldives. Mostly sharks appear in the kandu channels. But you may see baby sharks even from the shore. But let’s talk about hammerhead sharks. They’re hard to meet as you need to dive 5-10 minutes before the sunrise in the deepest part of the ocean. If you’re quite lucky you’ll see from 1 to 3 of them. The most popular site to see these sharks is near Rasdhoo. But it probably depends on a season because people tell quite controversial things about this site. Most of these sites are available from liveaboards only. Night diving with sharks. The most popular site for this is Alimatha Jetty, Vaavu Atoll. It’s located near Alimatha Aquatic Resort. Here you may meet a lot of nurse sharks which swim so close that you can even touch them! But the biggest disadvantage of this place is that it is too popular and attracts a lot of divers. So there could be up to 50 divers at a time! Among more than 600 species of exotic fishes, you may spot barracuda which is usually coming up in shoals, tuna, napoleon fish, parrot fish, the variety of moray eels, lion fish and many others. There is also no lack of smaller marine life and those who delight in the smaller species will find many creatures that you would normally expect to find elsewhere in the world. Ghost pipefish, harlequin rasbora and halimeda hide discretely amongst the coral waiting for divers to discover them; the same goes for leaf fish and frogfish. Besides manta rays, you may also see mobula rays, eagle rays, sting rays etc. Stingrays are usually fed near resorts and even on the local islands sometimes (for example near Thinadhoo). You may dive with a great amount of sting rays at a site between Hulhumale (the airport island) and Sheraton Full Moon. Although it’s obvious that they come to be fed, but still it’s a very impressive experience! Diving from liveaboard, island-resort or local island? If you would like to dive in Maldives, there are several options available for you: the liveaboard, from a resort, or the cheapest option is from local island (stay in guest house and dive from local dive center). Let’s take a look on advantages and disadvantages of each of them. If diving is the main reason for your trip to the Maldives then liveabord is your perfect choice. Today liveaboards are very comfortable and some of them, like Scubaspa Maldives, positioning themselves as a floating resort with all facilities. You will be able to visit the perfect dive site at the ideal time for the given sea conditions and seasonal variation. Each dive will be different and you will be able to dive up to three or four times a day (for example Carpe Vita provides 4 dives every day) and you’ll be able to admire all the beauty of the marine life being left to yourself. All the dives will take place in different sites so definitely they’re going to be varied. You may choose out of 20 different routes which go mostly through the central part: North Malé, South Malé, Vaavu, Ari Atoll. But several routes lie to the south (Thaa Atoll, Gaafu atoll and further) and to the north (usually Baa и Raa Atolls). Usually liveaboard lasts for 7 nights, but also you may do a longer trip for 10 days (Carpe Diem has 10 days cruises) and the longest one is up to 14 days. The longest trip starts in в Hanimaadhoo (north) and finishes in Addu City (deep south). Besides diving experience, you will also get to visit some of the resort islands and dine on a sandbank or an uninhabited island somewhere in the middle of the ocean. What next? Check liveaboard offers here. If you choose liveaboard diving, it’s better to have at least 30 logged dives and have a certificate not lower than PADI AOW before you come. That is because many of the dives will take place in currents and in 25-30 m deep. If diving is not the main purpose of your holiday in Maldives then you will probably be better placed at an island resort where a large variety of activities will be on offer such as water sports activities, fishing, visiting of local and uninhabited islands, etc. The dive guides in the hotels will be very knowledgeable about the local dive sites. In terms of safety, these island hotels also have very high safety standards, with onsite medical services and effective medical evacuation plans. The staff are trained to provide first aid if any incident happens during diving (even decompression chambers are installed on some of the resorts). The obvious disadvantage of diving from these hotels is the limited number of dive sites that you will be able to dive. And moreover you will be not able to dive when the conditions at these sites are far from optimal. The second disadvantage is the price. If you compare it with the price for a diving at a local island or a liveaboard it will be 1,5-2 times higher while you also may visit the same site staying at the local island or from a liveaboard. Diving from a local island in the Maldives is the cheapest option. Over the past few years, a new market has developed offering visitors an alternative low-budget holiday. Guest houses and small local hotels with modern dive centers started to appear. Now diving is much more affordable. Guest houses offer the activities and infrastructure that a luxury resort provide and at more considerable prices. So it’s important to plan your trip beforehand if you’re eager to save plenty a lot. The obvious advantage of the local island diving is that it’s cheap and affordable. What is more you are given the opportunity to see the life of the local people. Of course you should be ready to respect their laws and traditions. The Maldivian people are very open-minded and friendly with tourists, they’re eager to help and tell their guests about their island. What next? Check daily diving deals here. You’ll be limited with the choice of diving sites while visiting a local island as well as staying at a resort. However, you may choose from a variety of different dive centers where usually international instructors are working. Every local island has its tourist infrastructure and a hospital where you can receive first aid. When more serious accidents happen the patient is sent to Malé. Maldives abound with a variety of diving sites suitable for any level of experience, either you’re a beginner or an experienced diver. Considering that Maldives is a region of about 1200 islands, imagine how many places for diving you can choose from. So what is the way to find out the best site where you can meet all the sea creatures inhabiting these islands? Here a list of selected dive sited around the Maldives that you should visit. Maldives can be divided into four groups of atolls by the region. The North Region (Raa, Haa Alifu, Haa Dhaalu, Shaviyani, Noonu). The North region of Maldives stretches 170 kilometers from north to south. It is visited less than its neighboring Central region which is far more touristic. Moreover, the domestic flights are rather expensive and the seaplanes fly only to resorts. Only a few liveaboard boats sail on these routes, however, the local guides know all the sites of this region which are near the local islands or resorts. Anyway far more of the sites are located in the open ocean and unavailable to reach. Far away from the divers’ reach the coral reef is preserved very well. So this part for sure can be called a marine reserve. You can reach this region by the only fast and expensive air transfer because it is far from the capital thus you will definitely need the diver’s insurance. Moreover, it has to cover the evacuation too. Seasonality: the monsoon lasts from June to November, the dry season starts in December and finishes in April. Transportation: you may take either domestic airlines with a further option of a speedboat or a ferry, or a direct seaplane to the resort. Accommodation: the tourism in this region is developing very rapidly. The new guest houses pop up on the local islands, new airports and the resort islands are being built. And the prices are considerable so that this region is getting more and more affordable. This thila is located several hundred meters far from the uninhabited island of Dheburidheythereyvaadhoo. The initial depth is 15 meters. The fauna is rather varied so that you can see snappers, tuna and fusiliers. It is recommended to jump from the dhoni boat with an empty BCD and don’t stay on the surface. The submersion and ascending is recommended in the open ocean. This thila will be good for advanced divers. This mesmerizing site is located near Hideaway Beach Resort and Spa. Its reef is more like a sheer wall from 15 to 30 m from the surface and it continues with a sandy bottom. Most of the ledges on the wall are covered with yellow corals. Octopuses, moray eels, sweetlips, leaf fish inhabit the shallow lagoon waters. During the dry season, you can also see manta rays. Stingrays, shrimps and soft corals stay deeper in the ocean. The dive is better to start 200-250 meters out of lagoon and move towards the channel where the current might be very strong. Depending on its direction the diving guide decides on the side of the reef you can dive. This site is good for drift diving either for the beginners or for the experienced divers. Heaven and Hell is a very appealing site for those who enjoy diving in a current. It is located near the island of Theefaridhoo, Haa Dhaalu atoll. It is a thila which consists of the three blocks lying on the depth of 15-25 meters and covered with plenty of ledges in its southern part. You can also see plenty of soft corral in its north and western parts. Here you can meet a large amount of various fishes, stingrays, tuna, squirrel fish, nudibranchs, trevallies, fusiliers. It’s better to dive with the current because the depth here is big enough and do that fast without losing any time at the surface. The channel is between the western blocks is especially interesting and marine life abounds here. The site is available during the whole year and it is good for good divers who already experienced diving in the strong current. This ship sank in 1963 on the depth of 15 meters. But still some of its parts are visible from the surface. It’s easy to recognize its propeller, stern and engine parts despite the serious damages. This wreck now serves as a home to stingray fish, nurse sharks, silvertip sharks, jacks, barracudas and other marine creatures. If you are patient enough you can be lucky to meet a flock of bottlenose dolphins. It is better to start your exploration from the stern of the wreck. Stingray fish hides in the propeller and nurse sharks prefer to stay under the metal parts of the covering. Other fish prefer the former engine compartment. This site is good for beginners but you should take care passing near the sharp parts of the wreck. This site is located to the north of Ekasdhoo, Shaviyani Atoll. Its reef abounds with a great variety of table corals and staghorn corals which grow on the depth from 5 to 30 meters. Be attentive and maybe you’ll be that lucky one who will see nurse sharks hiding in the depth. The eastern part of the site is far more captivating and it’s easy for the beginners as it doesn’t require any special skills to explore. The most popular and yet the most beautiful diving sites in the world are located in this region! It is no surprise at all here you can see the greatest variety of all types of corals, big schools of fish, sharks and manta rays. All liveaboards have never missed this place on their route. Since the Maldivian capital Male is located nearby, this region always gets the most attraction amoung the tourists. The guests arrive at the International Velaana Airport (former Ibrahim Nazir) and straight from there take a seaplane or a speedboat directly to their resort. Almost all the liveaboard cruises end up in the airport. There is no need to stay in Male or the airport island Hulhumale longer than a day (only in case of urgent necessity). A tourist won’t find anything to do here at all, especially in the capital, where the population density is one of the highest in the world. Though being a tourist doesn’t mean you should be scared of anything. However, if you would like to visit a local island or a resort then the capital is the perfect place for you because the transfer to those places might be very expensive. This popularity does have its disadvantages. For instance, it can happen that you may not be the only group diving from liveaboard boat at the same site. Nevertheless, the region offers a great variety of different sites so there will be space for everyone. Seasonality: the monsoon lasts from June till November, the dry season starts in December and ends in April. The most liveaboard boats don’t sail during the monsoon. Transportation: you can reach resorts and local islands by seaplane or speedboat. The local ferry goes only to the local islands. Accommodation: there’s almost no uninhabited islands in this region. The most variety of resorts and local islands with a good infrastructure attract plenty of tourists. Diving: as it was mentioned before the most beautiful sites are located here. These places are good for the beginners as well as for experienced divers. Marine life: the great variety of the marine life may impress even an experienced diver. This variety includes Halimeda Ghost Pipefish, gigantic manta rays (you may also see oceanic manta or Manta birostris) and nudibranchs which are mostly common to other sites of the world. This sea reserve protected by UNESCO is available only for snorkeling. The guests must be accompanied only by a certified guide. At this site you may see the largest amount of mantas coming to feed. They are swimming so close to you so it’s possible to touch them. The best time for a visit is August when it’s a full moon and a high tide. This thila is situated 1 km far from Soneva Fushi Resort and offers excellent diving experience all year round (including diving with mantas). But the best time for a visit is definitely a monsoon. The most interesting you may observe is associated with the southern and eastern parts of this thila: ghost pipefish, stingrays and mantas. The submersion is better to begin with the northern or the western part of the thila (depending on the current). In this case it could be better to explore the underwater caves. The site is the best for experienced divers. Having suffered from the fire these two small cargo ships sank in the 1980s. This site is easily recognized from the surface because it is marked with a buoy. Both of the ships are in a good condition and became a new home to the marine life. The larger one, Skipjack 1, can be explored even during snorkeling. When Skipjack 2 is available only for divers because it is 30 meters deep. The reef itself full with the marine life including stingrays, moray eels and nurse sharks. Due to the channel, it is recommended to dive a bit far from the ships not staying long on the surface. It’s better to start with Skipjack 2 because it is much deeper and then move towards Skipjack 1. This site is suitable better for the divers with the experience of diving in a strong current on the depth of 25-30 meters. Kuredhdhoo Kandu or Kuredu Express is one of the most popular places to dive in this atoll. It is located to the east of Kuredu Resort. You can see a great variety of sharks on the depth of 30 meters. It is also recommended using a hook to enjoy the marine life near you. This is another clearing station for mantas which is situated on the depth of 14-25 meters near the island of Fushifaru. Apart from mantas you can see the variety of blocks covered with corals. The best time to dive here starts from June and lasts till November. The submersion is better to start at the western part of this thila and then move towards the central part exploring the coral blocks on the way. It is recommended to end your dive in the open sea. The site is a protected area that’s why you should respect its marine life (as well as everywhere). The reef is smooth till the plateau starts which is 20-30 m. deep. Situated on the plateau the thila is 7 meters high. The reef has several clearing stations where mantas come to feed. You can also see grey and silvertip reef sharks, large fish, turtles, moray eels and giant barracudas. It is recommended to dive slowly without abrupt movements but just descends down to the bottom and see how these sea devils hover in the clearing stations. This thila is located in the north-eastern part of the North Male Atoll near the OBLU by Atmosphere Resort. Each part of the thila is like a sheer wall (excluding the western part). Near the south part you may notice an anchor which probably belongs to the ship The Swiss sunken in 1890. This site is more interesting during the monsoon because at this time plenty of sharks and eagle rays come to this place. What is more three enormous coral heads dominate in its central part. This site is located near Paradise Island resort and it is one of the most popular manta ray clearing stations. Mantas come either alone or in groups up to 8 mantas! I dived here three times and there were mostly up to 3-5 mantas at a time. The best time to visit is June to December. This site is best for the beginners and there’s no need to approach close to the station because you can scare off mantas. Due to its popularity you can meet a lot of divers here, unfortunately. This one is probably the most popular site on Maldives. It is located between Hulhumale and Sheraton Full moon resort. It is characterized by a great number of caves, big shoals of fish, soft and hard corals. The shoals of bannerfish which can include up to 1000 fish are really impressive! Apart from this, you can meet groupers, snappers, barracuda sharks, gigantic squirrelfish, oriental sweetlips, soldierfish and grubfish. The site is available anytime and is best for the beginners. This site is approximately close to the airport and the capital. The reef abounds with the variety of its marine distinguished by the blue tuna, reef sharks and large sea turtles. Sometimes you can meet up to 20 sharks during the same session! It is suitable both for experienced divers and for beginners. Embudu Kandu is a canal uniting the ocean with the inner part of atoll. It is better to dive during the incoming current. During this time you can mostly see sharks, barracudas, jacks and mantas. Because of the strong current it is not recommended to stay on the surface. During your dive you can try to cross the canal and explore the thila which is located 10-20 meters deep. But it is recommended only for experienced divers. It’s also a good idea to have a diving hook with you. This site is located to the eastern part of the south Male Atoll near the local island of Maafushi. It’s a small cargo ship sunken artificially to create a coral reef. It is popular with numerous fishes and corals. The most majestic creature of this site is a fish-toad which lives on the deck. There are also plenty of glassfish and batfish. In its holds, you can observe lionfish, lobsters, shrimps, and turtles feeding. Its caves and its ledges make the reef very attractive to all divers. And the lack of current makes it perfect to the beginners and night diviers. This thila is located to the north of Holiday Inn Kandooma resort. It’s on the depth of 12 m on the bottom of the canal. The eastern and northern parts are the most interesting for divers. You can meet schools of fish, mantas and sharks. The latter are mostly seen during the incoming current in the north part. At this time is it recommended to stay with a hook near the Corner watching grey sharks. This site is available anytime but is only recommended to the experienced divers. Guraidhoo corner is located to the south of the local island of Guraidhoo. It is a wide channel. You can get into a so-called “washing machine” here because of its unique landscape. The difference of the speed of its currents and their directions make it possible. It is dangerous for the diver because it is unpredictable and can throw you either up or down. The diving here starts in the south-west part and then you drift towards the peninsula. The submersion should be fast and you shouldn’t stay on the surface. It is recommended to end your dive with 70 bars (except 50) because you may trap into this “washing machine”. This site is suitable only for experienced divers. The season lasts from January to April. It is a truly unforgettable night diving with a great amount of nurse sharks near Alimatha resort. There’re actually plenty of good sites near this island. Sometimes you can meet up to 50-60 sharks here! But where do they come from? It is not a big deal but they are being fed here. That’s why stingrays, blacktip sharks and jacks come to the site. As a result, this site is very popular with divers. But for the strong current you should be very careful on the bottom. This is another cool site near Alimathaa Resort. This is a channel with a strong current. Here you may see numerous caves, ledges, different corrals and plentiful marine life. Miyaru is translated as a shark from Dhivehi which means you will see plenty of predators here. This site got its name from the variety of yellow coral. The closest island here is Thinadhoo. It represents several sheer walls. Apart from this you can see other types of soft and hard coral. Napoleon fish, moray eels, turtles and mantas can be seen here. This site is good both for experienced divers and for beginners. First that you should know is the size of Fotteyo. To explore it properly you need to have at least 3 dives! It is on my list of top three best sites on Maldives. The site is located in the eastern part of the atoll and mostly you can reach it only from a liveaboard boat because it’s rather remote. The great variety of the marine means you can see here shoals of various fish, sharks, corals, turtles and even hammerhead sharks. In the morning or the evening you can also see a flock of dolphins crossing the canal. Diving is recommended in the morning. This site is only good for experienced divers.